Palestinian chef Johnny Goric has cooked for President Barack Obama and served as a judge on the Palestinian version of Masterchef, a reality TV cooking show. In July, he put out his first cookbook — but rather than publish in his native Arabic or in English, Goric’s debut recipes are in Hebrew. 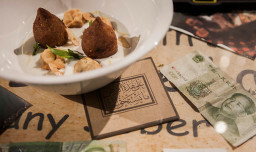 In the past two decades, the Israeli cuisine has flourished on the international scene. Last year the gourmet food and wine publication, Saveur Magazine, named Tel Aviv an “outstanding” food destination. The local edition of Masterchef is popular among Israelis and a homegrown cooking show, Game of Chefs, was recently remade for German television. Although it relies on the same local ingredients, Palestinian cooking has received much less international attention — until now.